My hands have given me a bad scare this winter. The flashpoint came after weaving on my class towels one day back in mid-December. My left wrist just ached that night, and I was not close to being done the weaving. Rest, bracing and conscious thought (prayer, inclusive) helped but the pain was nagging each time I worked even a little – okay, for me a little is still quite a bit. It started to dawn on me that my laptop computer work was also problematic. As in, neither comfortable nor reducing my risk of hand injury. Once we got past the fact that I do this much but do not in fact have an Etsy shop my family Doctor examined the hands. She was soon intoning, “carpal tunnel,” and “both hands.” In the 6 weeks that it has taken for me to get in for an E.M.G. test, I have been quietly having kittens. After all, the scheduling letter with its HOW IT IS DONE (emphasis, theirs) rubric was loud & clear. *** Be prepared to stay at least 60 minutes for this test. Naturally, I wanted a project for this ordeal and its waiting room. The waiting area was small, and shared with patients going in for Geriatric Assessment. The spinning time was closely watched by all parties. Finally, one gentleman in a wheelchair broke the ice. We laughed; I explained. A lady took up the thread. She does other work with her hands, embroidery and crochet mostly. Arthritis has been difficult but she can’t imagine sitting and watching TV without using her hands. With each back & forth she opened-up more, asking questions and sharing. Another lady was in between us, listening closely as was the first gentleman. I reminded her of her childhood in Czechoslovakia. They grew cotton, and flax. She remembered her Mother preparing the fibres in the creek. Quietly now she answered, “It was the war. That’s what happens in war.” I told her about my friend whose family was burned out of their home in Slovenia. A neighbour kept a length of handwoven linen that survived the fire, and my friend received it from her years later. I told her how wonderful it was to be shown such a cloth, and she agreed. She said, “Yes, Slovenia. It is the same.” Then she said even more quietly and with feeling looking me straight in the eye, “We are in Canada now. We are safe now.” I nodded yes as she repeated the words again. The gentleman’s name was called, and she went with him. We all parted the better for the talk, I think. Folks have largely similar responses to my spindle spinning (“I don’t have the patience” ring a bell?). I love when they ask, and always thank them. The best times are when they share their stories; are transported back to their own spinning culture. It’s a privilege to listen and to have sparked that fire. The Physiatrist determined that the damage is not at the nerve level – the readings were normal. I do have De Quervain’s Tendinosis, and will do non-surgical treatment. They said that I speak like spinning, knitting & weaving are sports! Well, yes, Doctor. The idea that I can use my hands with thumb splints is really not on. We can all agree that opposable thumbs are needed for all of our material culture, right? I left with good news, a spinning story, and the Czech-Canadian lady’s acknowledgement. Her last words were that she could tell I was ‘the real thing’ and would do well. 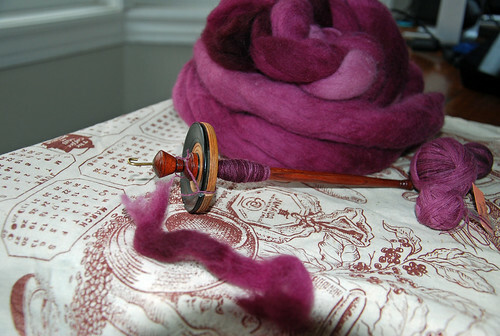 Categories: Good Gnus, Spinning, What I'm up to | Tags: drop spindle, Merino wool, socializing, Spinning | Permalink. What a beautiful story Lara and the fiber you are working with in the picture is gorgeous. What is the spindle pictured with the fiber? Thank you, Shelley! The spindle is a Kaari by Hatchtown Farm! I really love how it handles, and is perfect for carrying out & spinning sitting down. Two thumbs up on this one! What a lovely blog post! I loved the waiting-room stories – so transcient, but so real. Thank you for sharing these moments.